Festive Friday is a Blog Hop happening the second and fourth Friday of each month, showcasing Christmas cards. We are rounding out the year, theres only a few more hops! 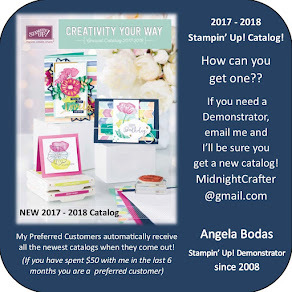 I stamped the swirls from Season of Joy (#110384) onto white card stock using VersaMark ink (#102283), then embossed with Stampin' Emboss Clear Powder (#109130). I then inked up and stamped off the tree from the same set in Soft Suede and stamped it over the embossed sections. 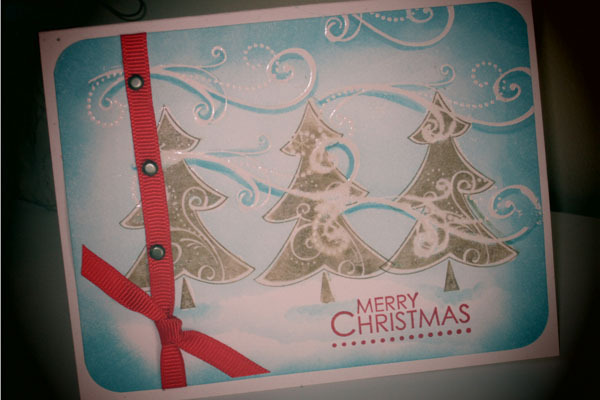 Then, I used my Blender Pen (I dont have a Versa Mark marker) to add Versa Mark to the (completely dry) stamped tree images, then embossed with more clear powder. This protects the white areas in the image.﻿, when you go to the next step. See the shine of the embossing? Pretty in Person, honest! 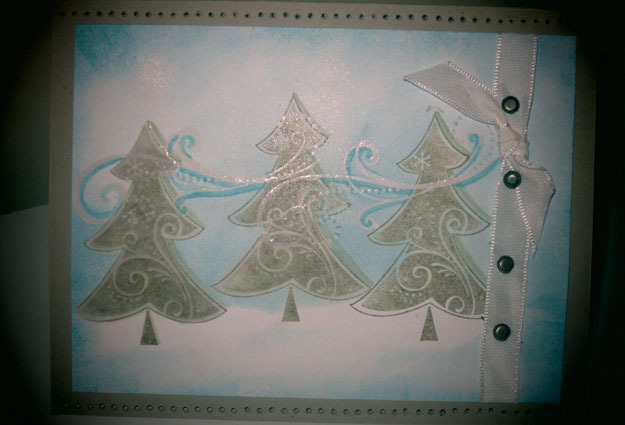 Next, I sponged Bashfull Blue across the field of the card, then added some Marina Mist sponged around the edges. The emboss-resist technique uses a brayer, for more full coverage, but I think the sponge worked well and gave a similar soft look. I used my Blender pen once more to pick up some Marina Mist ink and add it to the underside of the swirls, accenting the curls of the swirls. 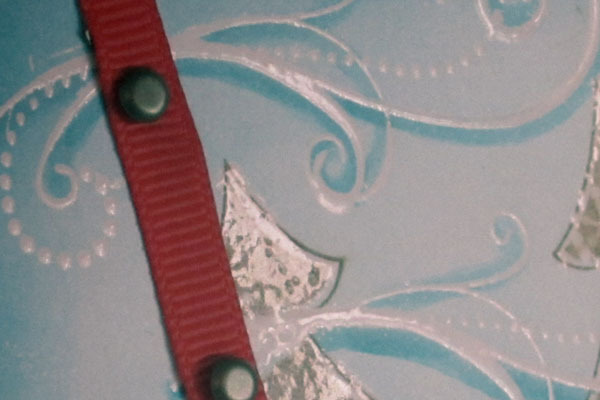 The Real Red Grosgrain Ribbon (#109034) is accented with 3 Brads from the Metallic collection (#119741), and I stamped a sentiment in Real Red ink. Mounted, and voila! 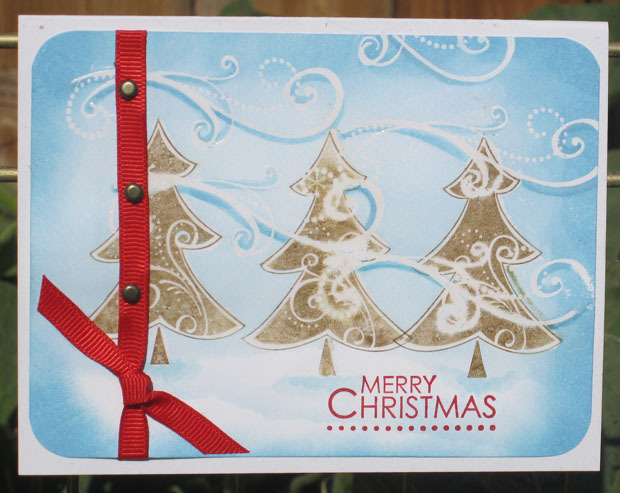 Ready to send some Festive Friday greetings! How gorgeous - and shiny! 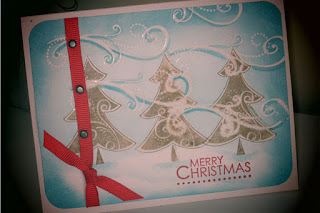 this is a very pretty card - embossing is really new to me - and after looking at your card I want to do some embossing. joined. My favorite Christmas images are Trees. 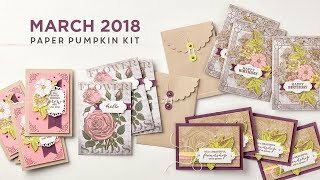 Beautiful card... love all the techniques you used!